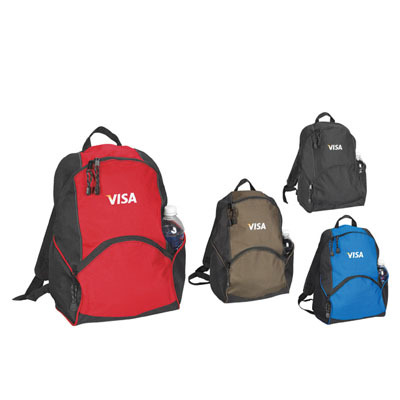 Full size pack with front zippered pocket, padded, adjustable shoulder straps, side water bottle pocket. Size: 12 1/2" x 17" x 7". 600D Polyester *There is a 8 % surcharge on the price of this calendar if it is shipped to California, Tennessee, or Maryland, so the price per calendar shipped to these states will be 8 % more than you see on the website. This surcharge will not be reflected on the order form, but will added to your total and charged on your credit card. 50 1 color(s) imprint at $446 ONLY $8.92 each. 50 2 color(s) imprint at $518 ONLY $10.36 each. 50 3 color(s) imprint at $590 ONLY $11.80 each. 50 4 color(s) imprint at $661 ONLY $13.22 each. 150 1 color(s) imprint at $1,036 ONLY $6.91 each. 150 2 color(s) imprint at $1,193 ONLY $7.95 each. 150 3 color(s) imprint at $1,350 ONLY $9.00 each. 150 4 color(s) imprint at $1,485 ONLY $9.90 each. 250 1 color(s) imprint at $1,632 ONLY $6.53 each. 250 2 color(s) imprint at $1,837 ONLY $7.35 each. 250 3 color(s) imprint at $2,052 ONLY $8.21 each. 250 4 color(s) imprint at $2,267 ONLY $9.07 each. 475 1 color(s) imprint at $3,034 ONLY $6.39 each. 475 2 color(s) imprint at $3,394 ONLY $7.15 each. 475 3 color(s) imprint at $3,754 ONLY $7.90 each. 475 4 color(s) imprint at $4,101 ONLY $8.63 each. 500 1 color(s) imprint at $3,191 ONLY $6.38 each. 500 2 color(s) imprint at $3,567 ONLY $7.13 each. 500 3 color(s) imprint at $3,943 ONLY $7.89 each. 500 4 color(s) imprint at $4,272 ONLY $8.54 each. 1000 1 color(s) imprint at $6,064 ONLY $6.06 each. 1000 2 color(s) imprint at $6,734 ONLY $6.73 each. 1000 3 color(s) imprint at $7,403 ONLY $7.40 each. 1000 4 color(s) imprint at $8,073 ONLY $8.07 each.